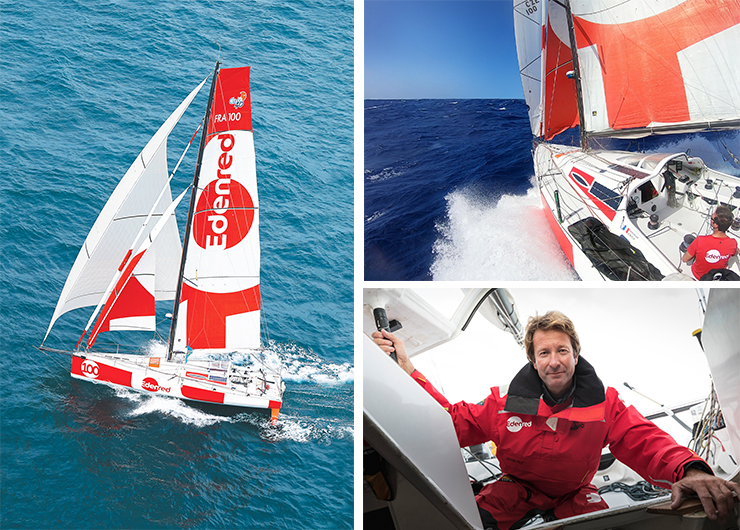 Following on from its sponsorship during the Route du Rhum – Destination Guadeloupe 2018, Edenred, the global leader in payment solutions for the working world, has renewed its commitment to Class40 yachtsman Emmanuel Le Roch. The French skipper will sail under Edenred colors for the entire 2019 racing season and participate for the first time in the Transat Jacques Vabre. In this double-handed transatlantic race, participants will set sail from Le Havre, France on October 27 and head toward Salvador da Bahia in Brazil. After helping Emmanuel Le Roch realize his dream of participating in his first Route du Rhum solo transatlantic race, the Edenred Group will continue the “True Dream” adventure alongside the skipper in 2019. The agenda for the year includes nearly 10,000 nautical miles of sailing, with the Défi Atlantique up first, followed by the Normandy Channel Race, the Armen Race and then the Transat Jacques Vabre, the last big event in a season focused on teamwork. The name of the sailor who will serve as co-skipper alongside Emmanuel Le Roch for the Transat Jacques Vabre will be unveiled in the coming weeks. “Edenred is proud to continue this inspiring partnership with Emmanuel Le Roch. Emmanuel represented the Group so well during the Route du Rhum, showing extraordinary courage and selflessness. His personality and values perfectly embody the commitment, imagination and simplicity that drive Edenred’s 8,500 employees in 45 countries. This year again, he can be assured of the enthusiastic support of our teams, particularly since the route for the Jacques Vabre race connects two of the Group’s most emblematic markets, Brazil and France,” said Bertrand Dumazy, Chairman and Chief Executive Officer of Edenred.